Walking is one of the simplest, cheapest and safest forms of exercise, offering a number of important health gains, according to the American Heart Association. Whether you partake in leisurely walking or speed walking, the beneficial effect of walking can be improved by adding hand weights to your walking routine. Adding hand weights to your walk is an easy transition because the size of weight used and the amount of arm movement can be varied to meet your individual fitness level. Carrying hand weights while walking allows you to work your upper body more intensely than walking without them. By recruiting muscles in your lower body as well as your upper body, the intensity of your workout is increased, thereby increasing the amount of calories burned per minute. By carrying hand weights, you increase the amount of weight your body must move through space. Because it takes more energy to move more weight, making yourself heavier by adding hand weights to your walking routine causes your body to burn more calories in order to move. Walking without weights does nothing to tax the muscles of the upper body. Adding hand weights to your workout, however, will help to improve muscular strength and endurance of the both the upper and lower body. Whether you merely carry the hand weights or actually perform resistance moves such as biceps curls during your walk, you will benefit from increased muscle fitness. The mere act of carrying the weights will force your muscles to maintain a static contraction. When you deliberately move your arms, you are creating dynamic movements, which improve your arm muscles even more. Your lower body also benefits from carrying hand weights, in that they increase the total weight your legs must bear. This extra weight will force the muscles of the lower body to work harder, resulting in improved muscular strength and endurance. 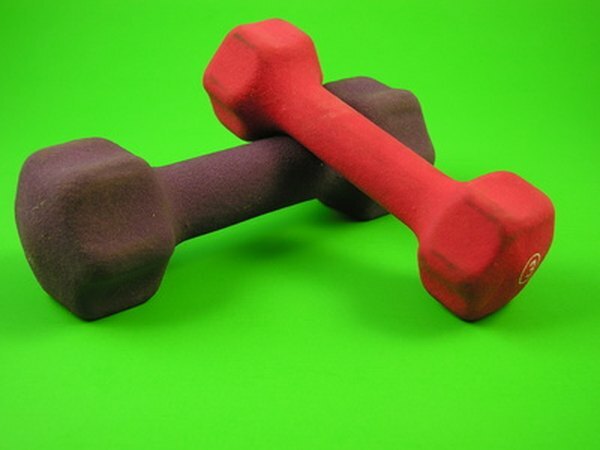 Walking with hand weights allows you to multitask, thereby saving valuable time. By combining weight training with cardiovascular exercise, you are getting a multifaceted workout in the time it takes you to perform one. Walking without weights offers cardio and lower body benefits, but your arms get little benefit. When using hand weights, however, you are able to strengthen the muscles in your arms and tone your legs while engaging in sustained cardio exercise.